I know today’s tip doesn’t sound exciting. Every weekday, however, I pack cold lunches for the girls to take to school. At the beginning of the year, I bought these cute little animal gel packs to keep their lunches cold. Emmy still has hers; but Lily’s gel pack wasn’t sealed properly and the gel started to leak out of it. I had to throw it away. Ice in a Ziplock bag just melts and leaks all over. As an alternative, I sometimes freeze a yogurt tube. The frozen yogurt acts as an ice pack in my daughters’ lunch boxes, and the yogurt slowly thaws enough to eat at lunchtime. But I can’t pack yogurt every day. The following tip sounded like the perfect solution to my ice pack problem when I spotted it on Pinterest. I buy pop-up sponges from Trader Joe’s. They come in a package of 12 and are very thin. Just add water, and the sponges “pop up!” Lily and Emmy love popping up these sponges. 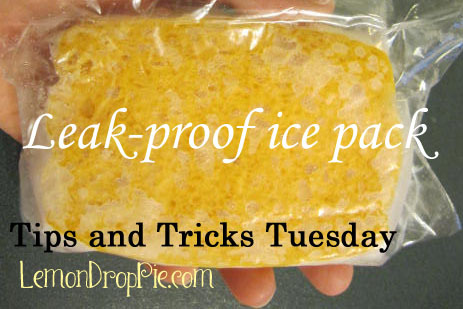 To make an ice pack, all I did was saturate the sponge with water, slip it into a Ziplock bag and put it in the freezer overnight. In the morning I had the perfect sized ice pack. 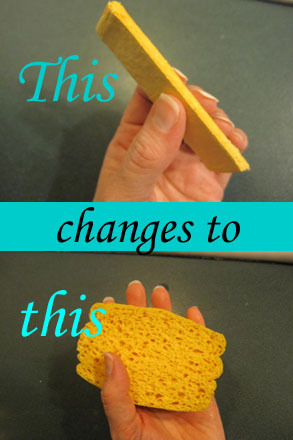 The idea is that as the ice melts, the sponge will soak up the water. I wasn’t positive it would work, but I was willing to give it a try. I put the frozen sponge in Lily’s lunch box, and asked her for a report when she got home. Lily told me that the sponge was still cold at lunchtime and it hadn’t leaked at all! I put the sponge right back in the freezer, and I’m going to use it in the future to keep cheese sticks and applesauce cold in Lily and Emmy’s lunches. Do you have a tip or trick that makes life easier? Link it up below! Please link up a tip that you have personally tried. If you have a pin on Pinterest that you would like to share, you may also link up the pin. Only link pin images that you have created yourself. Would you like me to add you to the group Tips and Tricks Pinterest board? Tell me in the comments below! Be nice–like, share and pin the tips you find useful! AWESOME trick! I don't have any tricks. That's my problem! I can't wait to read all the post that link up! I can use all the help I can get! My recent post Hey Oscars, How About Trying For Classy?